Oolong (Chinese: 烏龍 → wūlóng) is a traditional Chinese tea somewhere between green (no oxidation) and black (fully oxidized) teas in oxidation. This it is known as semi-oxidized or partially oxidized. Like green, black, and white teas, oolong tea comes from the camellia sinensis plant. Oolong has a taste more akin to green tea than to black tea: it lacks the rosy, sweet aroma of black tea but it likewise does not have the stridently grassy notes that typify green tea. It is commonly brewed to be strong, with the bitterness leaving a sweet aftertaste. There are several subvarieties of oolong, with those produced in the Wuyi Mountains of northern Fujian and in the central mountains of Taiwan being among the most famous. Oolong teas have long been famous for for aiding digestion as well as various other health benefits. While the actual effectiveness of oolong tea's medicinal properties is still to be determined, this tea is certainly an example of human creativity in processing the bounty of nature in a variety of ways to produce novel items for consumption and pleasure. The name oolong comes into the English language from the Chinese name (烏龍), pinyin: wūlóng. Wu means black and Long means dragon; hence Black Dragon tea. There are three widely accepted explanations of the origin of the Chinese name. According to the "tribute tea" theory, oolong tea came directly from Dragon-Phoenix Tea Cake tribute tea. The term oolong tea replaced the old term when loose tea came into fashion. Since it was dark, long, and curly, it was called Black Dragon tea. According to the "Anxi" theory, oolong tea had its origin in the Anxi oolong tea plant. A man named Sulong, Wulong or Wuliang discovered it. Another tale tells of a man named Wu Liang (later corrupted to Wu Long and Oolong) who discovered the tea by accident when he was distracted by a deer after a hard day's tea-picking. By the time he remembered about the tea it had already started to oxidize, but he prepared it anyway, and was delighted with the result. Oolong is a traditional Chinese tea somewhere between green and black in oxidation. It ranges from 15 percent to 75 percent oxidation. The uniqueness of oolong tea comes from a withering process in the strong sun to remove moisture and then shaking to bruise the edges of the leaves so they oxidize faster than the center. The leaves for oolong are picked just when they reach their peak, and must be processed immediately. Oolong tea leaves are prepared in two different ways. Some teas are rolled into long curly leaves, while Anxi and Taiwan teas are pressed into a ball-like form similar to gunpowder tea. The former method of processing is the more traditional. Withering (萎凋; wěidiāo): Sun dry or air dry to remove moisture partly. Cooling: Cool off in shaded area. Yaoqing (摇青; yáoqīng): Gently tossing leaves to bruise the edge of leaves to create more contacting surface for oxidation. Cooling and Yaoqing are repeated multiple times. Shaqing (杀青; shāqīng): The procedure is to stop oxidation with high heat. Premium leaves are usually stir fried in a large pan over high heat, large productions are done by machine. Rouqing (揉青; róuqīng): The tea leaves are rolled into strands or nuggets before dehydration. Roasting: Roasting with low heat to dehydrate tea leaves, this step can be repeated with temperature variations to produce flavors of choice. While most oolongs can be consumed immediately postproduction, like pu-erh tea, many oolongs benefit from long aging with regular light roasting with a low charcoal fire. Before roasting, Oolong tea leaves are rolled and bruised to break open cell walls and stimulate enzymatic activity. The process of roasting removes unwanted odors from the tea and reduces any sour or astringent tastes; in addition, the process is believed to make the oolong tea more gentle on the stomach. Tea connoisseurs classify the tea by its aroma (often floral or fruity), taste and aftertaste (often melony). Oolongs come in either roasted (炭焙) or light (密香 or 清香). Generally, 2.25 grams of tea per 6 ounces of water, or about two teaspoons of oolong tea per cup, should be used. Oolong teas should be prepared with 180°F to 190°F (82°C-87°C) water (not boiling) and steeped 3-4 minutes. High quality oolong can be brewed multiple times from the same leaves, and unlike green tea it improves with reuse. It is common to brew the same leaves three to five times, the third steeping usually being the best. Big Red Robe in Chinese, a highly prized tea and a Si Da Ming Cong (四大名樅, literally: The Four Great Bushes). This tea is also one of the two Oolongs that make it to the list of Chinese famous teas. Golden Water Turtle in Chinese, a Si Da Ming Cong. Iron Arhat in Chinese, a Si Da Ming Cong. White Cockscomb in Chinese, a Si Da Ming Cong. 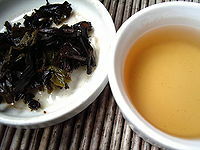 A light tea with light, yellowish leaves. Cinnamon in Chinese, a dark tea with a spicy aroma. Water Sprite in Chinese, a very dark tea, often grown elsewhre. Iron Guanyin in Chinese, this is a tea from Anxi in South Fujian. It is very famous, in fact a 'Chinese famous tea', one of the ten most notable Chinese teas, and very popular. As the name implies, Dancong ("single bush") teas are clonal or single-bush productions. Tea cultivation only began in Taiwan in the mid nineteenth century. Since then, many of the teas which are grown in Fujian province have also been grown in Taiwan. Since the 1970s the tea industry in Taiwan has grown at a rapid rate, in line with the rest of Taiwan's economy. Due to high domestic demand and a strong tea culture, the majority of Taiwanese tea is bought and consumed by the Taiwanese. Grown in the Alishan area of Chiayi County, this tea has large rolled leaves that have a purple-green appearance when dry. It is grown at an elevation of 1000 to 1400 metres. There is only a short period during the growing season when the sun is strong, which results in a sweeter and less astringent brew. It produces a golden yellow tea which has a unique fruity aroma. Also romanized as Baozhong, a light floral Oolong with unrolled leaves of a light green to brown color. Originally grown in Fujian it is now widely cultivated and produced in Pinglin Township near Taipei, Taiwan. 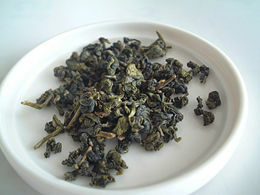 Darjeeling Oolong: Darjeeling tea made according to Chinese methods. Oolong tea contains caffeine which stimulates the central nervous system, sharpening thinking skills and improving mental alertness. Along with other teas, there is some evidence that drinking oolong tea reduces the risk of ovarian cancer. The more heavily oxidized oolong teas have long been famous for for aiding digestion, curing headaches, and cleansing the system of smoke and alcohol. Ooling tea soothes the stomach, acting as a counter balance to rich or greasy food. The lightly oxidized Anxi and Taiwanese oolong teas are viewed by traditional Chinese medicine as beneficial to the respiratory system. In recent times, oolong tea has been suggested as beneficial for controlling body weight, due to its effect of blocking the absorption of fats and carbohydrates. However, it is not a miracle weight loss ingredient. Rather, drinking oolong tea may support and enhance positive lifestyle changes that support weight loss, such as exercise, sleep, and a balanced diet, leading to faster results. ↑ 1.0 1.1 Oolong Tea History: The Story of Black Dragon Amazing Green Tea. Retrieved February 7, 2014. ↑ Fergus Ray-Murray, "Oolong (Wu Long) Tea", oolong.co.uk. Retrieved February 7, 2014. ↑ 3.0 3.1 3.2 Seven Cups, Harvesting and Making Wulong Tea, www.sevencups.com. Retrieved February 7, 2014. ↑ 4.0 4.1 有記名茶, 烏龍茶初製方法 www.wangtea.com.tw. Retrieved February 19, 2014. ↑ 5.0 5.1 5.2 Guang Chung Lee, The Varieties of Formosa Oolong The Art Of Tea Magazine Issue No. 1, 2006. Retrieved February 19, 2014. ↑ Upton Tea Imports, "A Brief Guide to Tea" Retrieved February 19, 2013. ↑ Oolong Tea Uses and Effectiveness, Webmd.com. Retrieved February 19, 2014. ↑ Beth Johnston, Oolong Tea and Weight Loss Teas Etc. Retrieved February 7, 2014. Goodness, Richard. Oolong Tea: Covering the Basics Tea Muse. Retrieved February 7, 2014. All links retrieved December 21, 2018. High Mountain Oolong and the Chinese Art of Tea - article by Daniel Reid. This page was last modified on 21 December 2018, at 15:39.